“I have a photographic memory . . . I like to tell my little joke whenever I teach visual journalism. It usually gets the laugh I want, but it is painfully true. Great pictures burn a memory into our brains like no other story form. In August of 2004 the Sun-Times was moving the newsroom to a brand-new facility and I got the chance to curate a collection of the best news photography taken by the staff of the Chicago Sun-Times over the previous 60 years. Amazing and historic news images from the streets of Chicago taken by daring photojournalists. 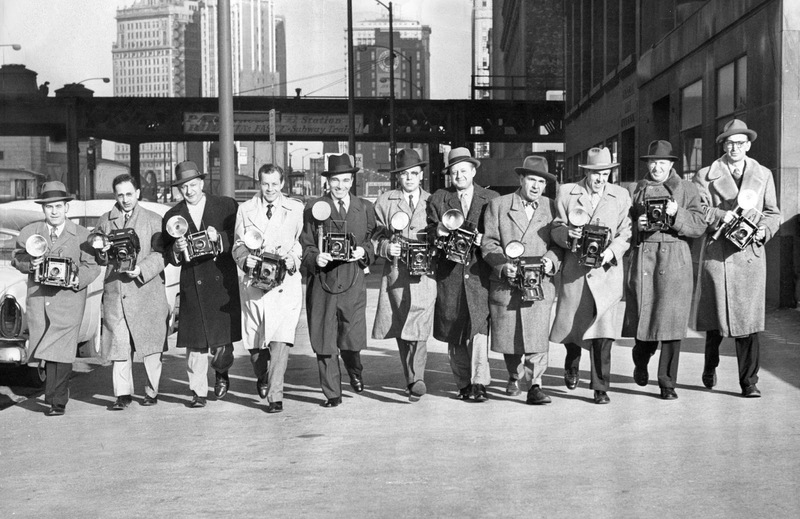 Their resulting 250-image black-and-white photo collection recalled the glory years of newspaper photography in Chicago. Breaking news, sports and celebrities, gangsters, disasters, and investigations. When real people were doing extraordinary things in Chicago, you could be sure that those fleeting moments of history would be remembered because the Sun-Times ‘lensmen’ would be there. They had to be. There were many newspapers in Chicago in those days and the competition was fierce and made everyone better. Alas, the newspaper barons took this bounty for granted. Many great, historic images were lost because archives were not well-maintained. Cahan spent months digging through unmarked microfiche, cabinets, boxes and envelopes to hunt down many of these gems. In this cave of wonders you could find a lost Chicago and even photos of Al Capone, if you knew where to look. But you would also find a horror scene. Broken glass plates (The photo negatives of the period) and a general chaos of unmarked envelopes, pilfered negatives and random piles. Photos take time to catalog and care for. They are fragile artifacts. That was the message that went unspoken by the owners of those once great newspapers. I was so moved by what I saw in the reel room, that I wrote an impassioned letter to the editor of the Tribune saying that he was literally sitting on a gold mine of visual history. 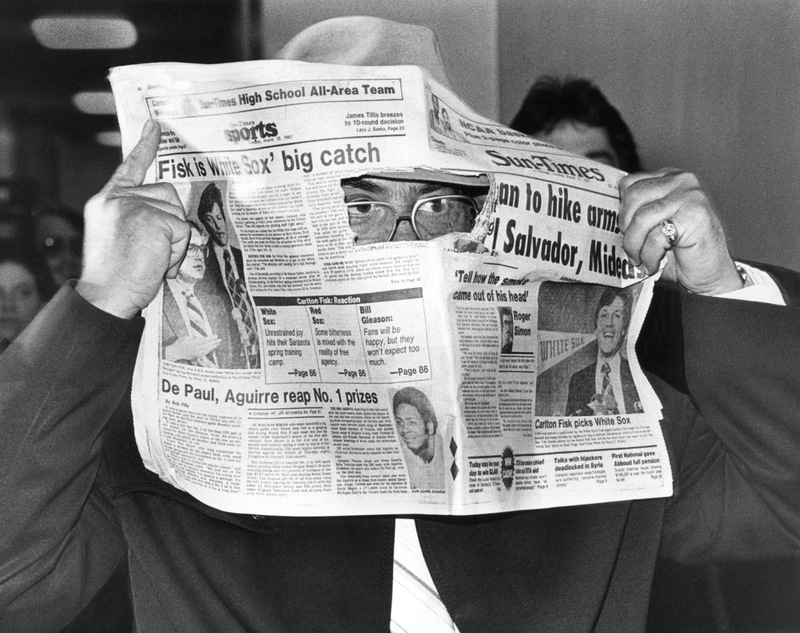 But now the current Trib editors are starting to mine that vault of photojournalism gold, re-discovering their lost treasures (Like the Capone photos). 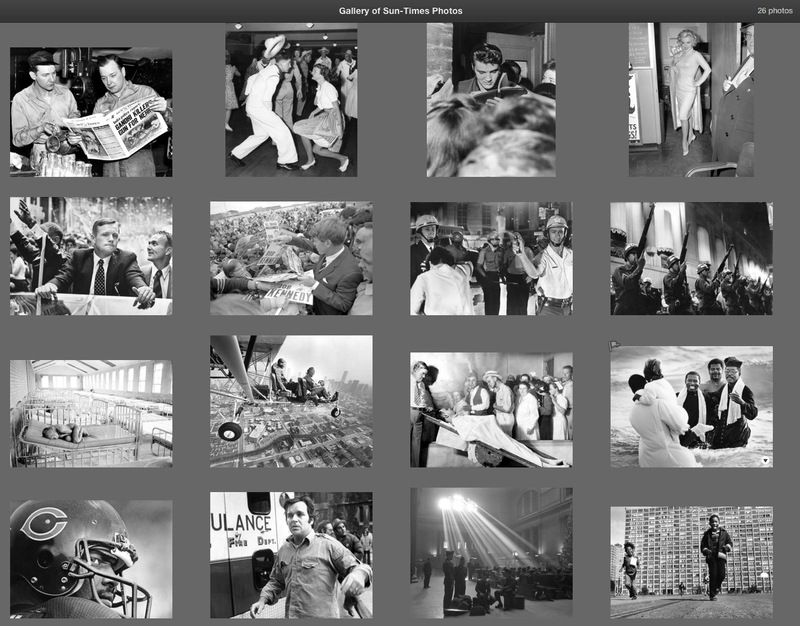 Cahan’s painstaking search through the Sun-Times photo archives proved timely. As he was piecing the fragments together and preparing his book, I wrote another memo. This time to the editor of the Sun-Times and proposed that we could make a photo gallery from the best of these images to grace the Sun-Times’ new newsroom at 350 N. Orleans. And so I began to curate the collection. Finding a local photo printing house that could make, frame and install the gallery-sized photos on a tiny budget. Every photo tells a story and I had a simple idea to let this collection silently retell many of Chicago’s greatest stories. The walls of the Features department would get the iconic Marilyn Monroe, Elvis and Sinatra photos. Sports would get the historic Cubs, Sox, Bears, Hawks and Bulls photos. News would get the breaking news and investigative news photos and this idea carried on though Business and the main news conference rooms. The creation of the photo exhibit was done quietly and out of the limelight. The first time that my fellow journalists saw the exhibit on full display was the moment they first stepped into their new digs. I wanted their first memories of their new home to be formed from their proud photo legacy. We had so many images that we were also able to line the hallways in advertising, circulation and the grand hallway to the publisher’s suite. Everyone was proud to share this legacy. I still hope these large, bold news images are lining the walls of the Sun-Times offices. They are the benchmark. The news photographers who made these images may have been dismissed, but the memory of their extraordinary effort remains. Burned into our brains forever.